Over the next three posts I am going to reveal three wonderful (inexpensive) things that are great for your health. When I first heard about these three things during my program at IIN I was skeptical and couldn’t really understand how three simple things could really change your life and improve your health, but they really DO work. It is amazing how small changes can have such a large impact on us. The first of these three things is a hot water bottle. Yes you know those big oddly shaped bags that you fill with hot water that you have probably seen in old movies and cartoons. It sounded a little crazy to me too at first but the benefits are really wonderful and they are inexpensive too. Fill it with hot water from the sink. The water bottle will stay warm for up to 2 hours. To combat illness: use as a warm, soothing companion to help you through flu, chills, and aches. 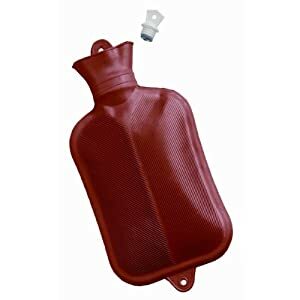 To ease menstrual cramps: a hot water bottle on the abdomen brings pain relief and soothing comfort. As a bed warmer: a warm hot water bottle placed in your bed makes for a cozy sleep, especially on cold winter nights. To ease arthritic pain: a natural, moist heat therapy for arthritic pain relief, especially great for hands. To calm children: a warm cuddly companion to provide a calm secure feeling when children are ill or upset. As a traveling companion: take it with you on trips to comfort you – no electricity needed. To calm your pet: placed under a blanket, a warm hot water bottle soothes puppies in new surroundings — it provides warmth and security and calms them down. To encourage restful sleep: to help you sleep after a high-stress day, lie down with a hot water bottle on your stomach, close your eyes and breathe deeply, so the bottle rises and falls. Many people carry a lot of tension there and the weighted heat releases it. Try it!